A more local, less mall-like Harborplace? For years, Baltimore’s Harborplace pavilions were so well known and so heavily patronized that there was no need for a sign. Everyone knew where they were. But that, it seems, is not a given anymore. As other places have opened along the waterfront and stolen some of Harborplace’s thunder, the owners have proposed to put up giant signs on the top of each pavilion, with capital letters spelling out HARBORPLACE. The signs would be visible from across the harbor and around the city, like the Domino Sugars sign. 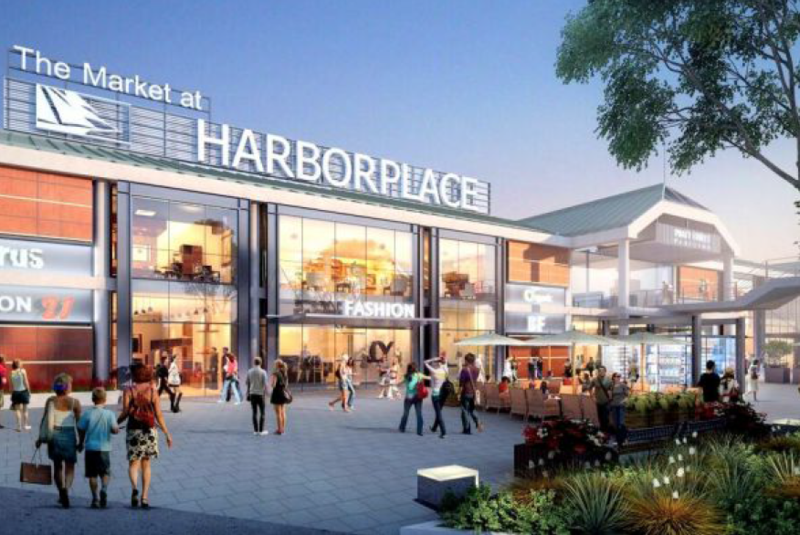 That’s just one of many changes proposed for the Harborplace pavilions in the first comprehensive makeover since they opened at Pratt and Light streets 35 years ago. Ashkenazy Acquisition Corp. of New York, the owner of Harborplace, outlined the changes in a presentation Thursday to the city’s Urban Design and Architecture Review Panel. • Eliminating the mall-like interior corridor on the first floor of the Pratt Street pavilion so each tenant will have a space that goes all the way through the building, from Pratt Street to the harbor side, rather than merchants in smaller spaces along a double-loaded corridor. • Creating a new multi vendor “market” with smaller spaces, presumably for fast food merchants or an Eataly-style environment, on the second level of the Pratt Street pavilion. • Creating two different looks for each pavilion, a “street side” look and a “harbor side” look. Adding elements of wood on the harbor sides to frame tenant spaces. • Eliminating the greenhouse-like sheds on the “street” sides of the pavilions and exposing more of the original concrete structure. • “Cleaning up” the buildings by coordinating signs and removing visual clutter. • Reducing the size of the automobile drop off on Pratt Street. • Possible removal of the pedestrian skybridge over Pratt Street that connects the Pratt Street pavilion with the Gallery at Harborplace. • Erection of large signs on the top of each pavilion, with capital letters spelling out HARBORPLACE. More Local Flavor? Although the future tenant mix was not discussed in detail, there was general talk of making Harborplace more of a “Baltimore-centric” destination. When the Rouse Company opened the two pavilions on July 2, 1980, it was at the forefront of a trend of building “festival marketplaces” on urban waterfronts around the country. The harbor side of the Pratt Street Pavilion. (Ashkenazy Acquisition Corp.) The 130,000-square-foot development cost approximately $25 million, and the city of Baltimore owns the land underneath. The original architect, Benjamin Thompson Associates, designed many of the subsequent festival markets. Rouse was sold in the 1990s to General Growth Properties, which ran into financial trouble and filed for bankruptcy court protection. Ashkenazy acquired Harborplace several years ago, while General Growth still owns the Gallery at Harborplace across the street. Ashkenazy has been working on plans to upgrade Harborplace for several years and has added individual tenants, but Thursday’s meeting was the first public presentation of a comprehensive plan for a makeover. Stephanie Mineo, senior vice president for leasing for Ashkenazy, said she does not have a budget or timetable for the proposed work. She said the pavilions will stay open during the construction period. The design team includes MG2, an architecture firm in Washington, D.C., and Seattle; Mahan Rykiel Associates, landscape architects, and Younts Design for graphics and signs. Floor plans shown to the review panel included names of some existing tenants with long term leases, including Cheesecake Factory,, M&S Grill, Tir Na Nog, Pizzeria Uno, Bubba Gump Shrimp Co., Hooter’s. Ripley’s Believe It Or Not Museum, and H&M. But many of the spaces were not labeled with a tenant’s name. Both UDARP members and Ashkenazy team members at Thursday’s meeting referred to a previous “working session” involving Harborplace and UDARP that was never listed on UDARP’s public agenda. “I think this is significantly better than our workshop,” said one panel member. In the working session, the design team apparently discussed the idea of splitting the Pratt Street pavilion into two buildings by creating an open-air walkway in the center. That option was not part of Thursday’s formal presentation. One panel member indicated Thursday that he was intrigued by the idea as a possible way to make the pavilion seem like less of a wall between Pratt Street and the waterfront and giving Baltimore three Harborplace pavilions rather than two. Based on Thursday’s presentation, Ashkenazy is not seeking to alter the height of the two pavilions or tear them down. The height is limited by the city’s Inner Harbor Urban Renewal Plan, and any change would need approval from the mayor and City Council. Mineo, the Ashkenazy executive, said the green color of the roofs, a key part of Harborplace’s original look, is not expected to change.